September 24, 2018 – NASA’s MAVEN spacecraft is celebrating four years in orbit studying the upper atmosphere of the Red Planet and how it interacts with the Sun and the solar wind. To mark the occasion, the team has released a selfie image of the spacecraft at Mars. The MAVEN team at LASP includes researchers and students at both the graduate and undergraduate level. MAVEN has been streaming back to Earth since the spacecraft went into orbit around Mars on September 14, 2014. 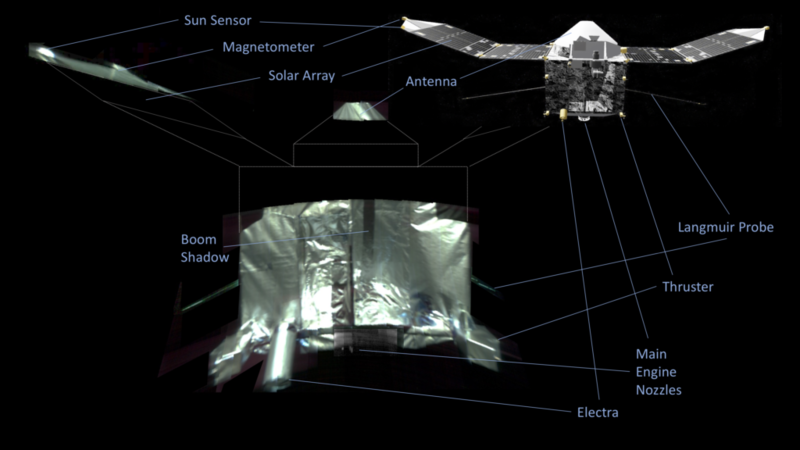 LASP provided two instruments for MAVEN and leads science operations and education and outreach for the mission. Next year, engineers will initiate an aerobraking maneuver by skimming the spacecraft through Mars’ upper atmosphere to slow it down. This will reduce the highest altitude in MAVEN’s orbit to enhance its ability to serve as a communications relay for data from rovers on the surface. Currently, MAVEN carries out about one relay pass per week with one of the rovers. This number will increase after NASA’s InSight mission lands on Mars in November.